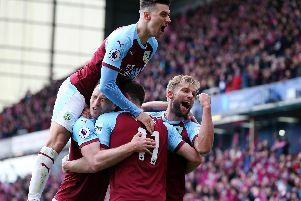 Clarets defender Ben Mee hoping for a derby double this weekend! Ben Mee is hoping for a derby double this weekend. The 26-year-old will likely be involved in the game against Blackburn Rovers on Saturday but can take a back seat for Sunday’s Manchester derby where his former employers City take on United at Old Trafford. However, Saturday’s fixture at Ewood Park takes precedence for the defender who has had mixed fortunes against the club’s arch nemesis. Mee put his dismissal in 2013 behind him to experience triumph in the derby 12 months later. “We’ve done well in recent years. It was nice to get the win there last time - it meant so much to everybody - and hopefully we can repeat that. “I’m unbeaten in four against them and we could probably have won them all.